Killer ride today at Stephens with 30+ riders!!! Conditions were perfect, a few stream crossings were tricky, but not too bad. 4th place at the Wendigo Ultra today. 1st Unsupported. What's going on up there, no rides posted yet today?? No pic as I had gloves on my gloves, nasty windy ride with some real climbing and even downwind was a spin-fest. Ouch. Flatter ride today, seven person crew rather than three and the wind took the day off. Pulled off at 27 miles and zipped direct home to attend a lunch. No sadness in that as my quads were hammered from Saturday’s ride. Water bottle was left on bike and good and frozen. Wow jim drops a pre-Alaska big time ride! Icy and frozen ruts on many trails. Still had some fun and starting to get used to the new ride. Left in the dark to ensure the bonii were in hand before 9AM. Everything else was gravy. Frozen fast funominal Allaire, I have missed you so. Sunny spots were starting to get sloppy by the time I finished. Tread lightly my friends. And a lil sunrise over The Res too. A fine day to be peddlin’. Left in the dark to ensure the bonii were in hand before 9AM. Everything else was gravy. Frozen fast funonimal Allaire, I have missed you so. Sunny spots were starting to get sloppy by the time I finished. Tread lightly my friends. Props on a big ride for a trail bike! Where the Strava link be? Thanks, sorry. Here you go. Nice matchie jersey and lid. I haven't been riding much at all. Today I got out for the Havoc Team practice at Stephens. When it's this cold I don't take pics. rode the extended tracks again yesterday morning, caught a great sunrise over south plainfield...i then proceeded to take one of the worst ever group selfies with my time - blurry and i chopped off our heads! i also had a chance to use the TSIWVCRS. could i have just removed the valve core? yes, but why would you when you can play around with a super sharp dirty needle?! found the path that fully connects the local edison/south plainfield/metuchen off road loop! I was meeting my family at Bahr's for lunch, so I first left a half-hour before dawn to ride to my buddy's house who was going to drive me to Hartshorne. 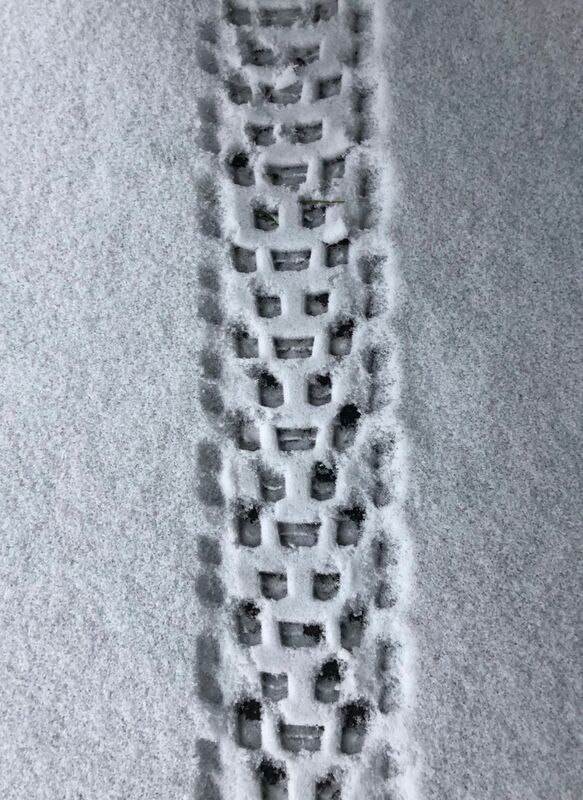 It was a 14-mile fat bike time trial to get there in under an hour. We then rode Huber Woods (1) and Hartshorne (2) until it started to turn to peanut butter. (The conditions were awesome until about 11:00.) After that, I departed from my compadres and headed down to ride the Beach in Sandy Hook (3). I started going up the beach but there was a horrific headwind and I missed high tide by quite a while, so it was almost impossible to ride. I still had about an hour and a half until my family was to come, so I headed back over the bridge to Atlantic Highlands. I rode through town and then up to Mt. Mitchell and then through the mansions in Atlantic Highlands. I rode the Henry Hudson Trail (4) on the way back to a tasty lunch at Bahrs. Dude, please fix whatever is going on with your tire before that needle ends up in your body! Lost 10 min since I didnt hit start, Core Creek has some 6 mile style ruts. Not sure who thinks riding where you leave 2" deep ruts is fun.